While human history is usually studied from the perspective of a few hundred years, anthropologists consider deeper causes for the ways we act. 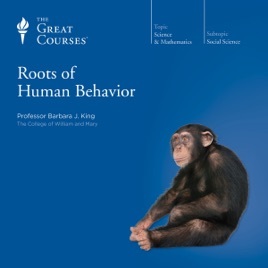 Now, in these 12 engrossing lectures, you'll join an expert anthropologist as she opens an enormous window of understanding for you into the thrilling legacy left by our primate past. In these lectures, you'll investigate a wealth of intriguing, provocative questions about our past and our relationship to primates. Are language and technology unique to humans? Have human love and loyalty developed from emotions of our primate cousins? Do the ways in which human males and females relate to each other come from our primate past? Have we inherited a biological tendency for aggression? How much of our behavioral, cognitive, and cultural identity have we inherited from our closest living relatives? How can the study of monkeys and apes lead us to a fuller picture of who we are? Along the way, you'll learn about the landmark moment in the 1960s when dramatic new findings about apes changed the way we thought about ourselves; you'll look back to a forest in Africa, millions of years ago, when a generalized great ape ancestor split into distinct lineages, then evolved and divided further to create our closest living relatives, and human beings; you'll journey to Asia and the New World, where other anthropoid primates followed their own evolutionary course, separate from the human lineage, yet still connected in important ways; and much more.This thorough and critical examination of our diverse primate roots will allow you to finally see our human family in an entirely new light.